The award-winning My Buggy Buddy Lock is an essential pram accessory and the answer to prayers of all parents with toddlers! 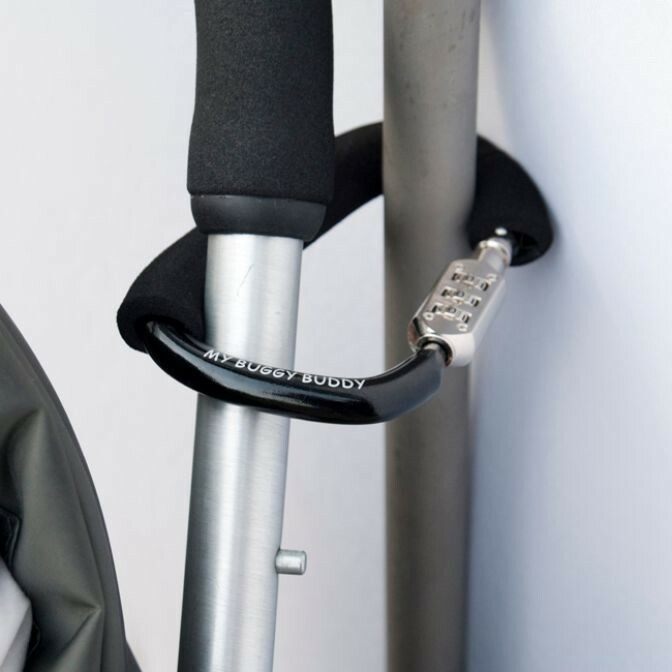 Not only does it allow parents to carry bags on their prams safely and securely, just like the Clip, but in addition it has a combination lock. This means that whenever you are out and about and can not take your pushchair with you, you simply secure it to a fence or railings using your unique combination code. An extremely handy buggy accessory! Multiple bags including shopping bags, changing bags and handbags can be strung onto the loop before the clip is locked back in place, putting an end to the frustrating and potentially dangerous practice of steering prams with one hand while holding bags with another. Obviously common sense is required so that you don’t overload your buggy! The foam coating ensures that the clip doesn’t mark or damage your pushchair. With prams costing hundreds of pounds it is a brilliantly cost effective insurance policy.